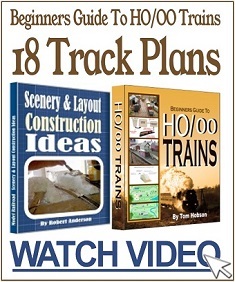 “My trains were running well until I ballast half the track. Now I find I have no power to the track at all where whereas I did before. I have been relying solely on rail joiners to transmit current between track sections, so I suspect adhesive or bits of ballast have probably fallen into the joiners somewhere on the track…creating an insulated joint. 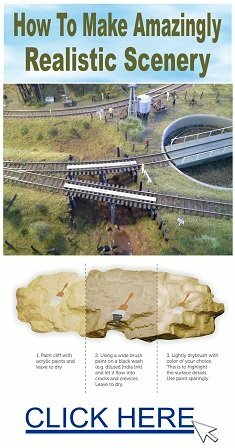 Assuming you are using long length flex track, yes it helps to have a feeder to each piece of track, especially with DCC. The problem I have had with soldering joins is lack of movement to compensate for expansion due to heat. I have had some serious buckling and now leave a gap between track sections (up to 2mm) depending on the time of year (hot or cold) I’m laying track. Although you should have feeder wires on each piece of track. Most likely your problem is dirty track take a razor blade and scrape your track just hard enough to take off any glue that may have dried on the track. Then get a good track cleaner and clean track. If your rail joiners fit tight this should fix your the problem. But I would still suggest you power each section of track. Ballasting is always a bit of a hassle! The best thing to do, is to get some track underlay – what you can do, is put glue on and then once laying down the track you can then add bits of glue between the sleepers – that is if there isn’t enough glue having laid down the rail – and then just pour it on and leave to dry. You’ll then have a track where you’ll find that the ballast has actually set in the right places. Otherwise, you can use track rubbers to clean the rails or you can use tools or a Stanley knife to get rid of the ballast from the rise of the rail. Hope that helps! I have rail joiners across many sections of track and only soldered groups of 3 sections together. I also send power to several blocks (not every section of track). But I would consider making sure the track is clean… easy to find advice here from various methods. Also make sure your loco’s wheels are clean. The materials used in ballasting (glue, etc) will likely impact the conductivity. The fact you have no power may indicate you do have a disruption in the wiring that occurred during the ballasting. I know I constantly checked the track by either running an engine or using a meter (https://www.micromark.com/Bachmann-Track-Voltage-Tester?gclid=EAIaIQobChMImuHxsaCj4AIVmITICh12zQehEAQYASABEgI8X_D_BwE) as I worked thru ballasting section by section. Good Luck. If you solder 2 wires to an auto bulb you can use this to test where your dead section is. If it is a dirty rail then clean it and if it is a faulty join then that one can be soldered. If everything was running fine before ballasting, I suspect one of 2 possibilities. One could be that you bumped/moved a section of track or wire breaking the connection. Two is glue entering at the joiners. Unless you were using a lot of glue or the joiners were loose, I doubt that the joiners would get completely isolated by the glue. The initial step I would take for myself would be to locate the fault. If you have a volt meter, you can measure the voltage along the various sections. If you do not have a volt meter, Robert’s suggestion of using a 12V bulb will also work fine. Most volt meters have an Ohms scale to measure resistance. With the meter set to the lowest scale, you should measure less than 10 ohms from rail to rail across a joiner. Technically it should measure 0 ohms, but it can vary due to the leads, the way you hold them and the cleanliness of the rails. I doubt that your problem is due to glue on the rails because you indicate complete loss of power in the ballasted section. Typically a dirty track would cause spotty voltage loss. That said. cleaning the track after such an operation is never a bad thing. Adding feeders is fine if you want to do the added work, if everything was running fine before it should be just as good after the problem is identified and fixed. The way I clean track is a little different. I do not use a bright boy or abrasive. I use a cloth saturated with: either cheap alcohol or acetone. I found 100% acetone at Dollar Tree and have been warned that it destroys plastic. But its in a plastic bottle. I was warned that its no good on the skin. Don’t breath the vapors. HAH! I have had no problems whatsoever. I like the acetone over alcohol because it don’t smell, don’t dry my finger skin and so far has not attacked any track. Now – I use it only with a cloth, and don’t get too much on the ties, etc. But also use a toothbrush or cotton swab to clean the sides of rails. Another thing I did was using the toothbrush, clean rail joints. And I use it to clean wire/connectors, etc. before soldering. Again, I like it better than alcohol. Finally, it cleans paint off brushes or spray can nozzles. So as for danger – I don’t see it. Now in all honesty, if it’s sold as nail polish remover, how can it be harmful? Since I’m male and don’t use nail polish LOL I can’t tell for sure. If the cloth/solution don’t clean, because of glue on the rail. Try using a very fine emory cloth or very light file or Xacto blade and be extremely careful to not scratch the rail. The bright boy seems to be OK, but I’d rather use something finer, even a pencil eraser. Now a final thought. I haven’t had time to test using graphite on the rails. But I heard that it helps electrical conductivity. Others may comment on this. From how you have described the effect on your finger I would think that you are not using acetone – it will dry your skin very very quickly. Basically you glue small stones around the sleepers to simulate the gravel used on the real thing. You can buy appropriately sized stone from your hobby store, or experiment with grit from a pet store. I have never handled any acetone that doesn’t have a distinct odor. Acetone is used extensively to bond acrylic plastic and plastic models. Not all plastics will melt with it though, hence being in a plastic bottle. Acetone that I have purchased has always been in a metal can. Emory cloth works because of the grit that is glued to the surface. Grit grinds and comes loose. Use it enough and it will begin to enter your rolling stock and it will not be good, to say the least. A file creates filings of the material you are filing. In the case of filing track rails, the filings are conductive metals. you can use either if you do it away from the table and clean the track thoroughly before putting it back. Graphite is used in motor brushes so it is conductive depending on the purity. The graphite sold in powder form is usually sold as lubricant. the powder is messy and really will not remain where you want it. 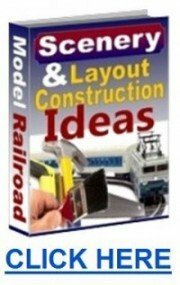 I would solder a wire loop from track to track around the rail joiners. To me, this would not interfere with expansion and would make it easier if a section of track needed to be replaced ! The acetone I referred to is probably not acetone as you know it. Since it’s sold as nail polish remover, I doubt if its harmful. As I said, I don’t smell it and it sure don’t seem like alcohol. Regular nail polish remover has oil and stuff in it. This that I buy does not. Yes, don’t breath too much of it. And for gosh sakes, don’t drink it. LOL Use it with care, just as you would anything like it. I just don’t like oil/Wahl clipper, or bright boys and since this is about ballast. I’d rather try acetone than alcohol or other such. I avoid water and water base when I can. 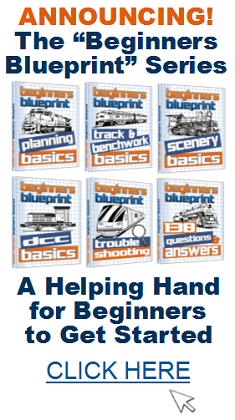 If you use Elmers for ballast, then you are bound to use water. And I don’t. So, please don’t get upset about my telling about acetone. I am not talking about the stuff at Ace or H-D or such. go over the track with a cleaner or cleaning solution where you put the ballast. You may have gotten glue or paste on the rails. I was wondering if ordinary household power extension cord wire would be okay to wire up a HO model railway layout. I have plenty of 10amp to 15amp power extension cords in the shed, which would save on purchasing wiring from a hobby shop, or would it be too thick to use? Any ideas? Strip the insulation off your old extension cords and use it for the main power feeds (or Bus feeds) under the layout if it is solid core. If the wire is multi cored (that is, not solid wire) leave the insulation on the individual wires but strip them into three separate ones. You can the buy 22 gauge hookup wire which is soldered to your rails fed down under the them through the base board and to the bus wires. Bigger is better when it comes to carrying electrical current, but above the base board you will need a little “invisibility” so smaller wires up there. I may input here, just a simple idea. The buss wire should be 14 to 16 gauge. Some extension cords are 16, but some are 18. I knew of one guy who used 18 gauge for feeders and buss. I would rather use 16 for the buss and either 20 or 22 gauge for feeders. That’s what I’m doing on a new shelf layout I’m working on right now. All the wire I’m using is what I had on hand/available. Avoiding purchase of new. But, be sure the wire is good. Copper. Stranded or solid – your choice. Some like solid, others like stranded. There are pros and cons about that, and IMHO it depends on what you like and are comfortable with. Stranded wire when soldered seems to work fine for me. i.e. Making sure the solder joint is solid, shiny and I actually grab and pull on each feeder as it’s installed. If any filing is required on the rail because of solder lumps, be careful there too. When soldering use the minimum amount of solder needed. Just be sure the connection is SOLID. 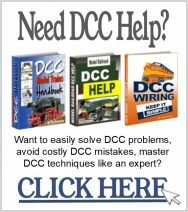 When running DCC, it is imperative that you install dropper wires on every piece of track and switch. I do not recommend soldering rail joiners if you ever hope to pick this track up some day, move it, or sell it. Do not ballast track for at least one full year until you have run and run and run ALL trains, carriages, heavy weights, etc over all your track and switches both directions many times. Then have a go at ballasting a section at a time. Once ballast is done, it pretty much is over. To take the track up now will almost ensure total destruction. I glue my foam sub roadbed to my green foam board base, then use very fine nails with small heads to pin the sleepers down thru these layers.Hobby foam adhesive releases very easily, should you ever have to pick up your rails, open up a tight curve, etc. Also build your benchwork in modules, bolted together, so someone can get it out some day.